Unlike platinum and silver gold is typically combined with other metals. This is done for several reasons. The most important is that in a pure state gold is too soft and malleable to be of service. To strengthen the alloy other elements are added. These metals are typically copper, silver, nickel, and palladium. When we talk about the purity of the alloy we typically talk about karat. 24 karat is pure gold. 18 karat is 18/24 or 75% pure gold. 14 karat is 14/24 or 58.3 % pure gold. 10 karat is 10/24 or 41.67% pure gold. In the United States an gold alloy can be as low as 10 karat and still be considered gold. 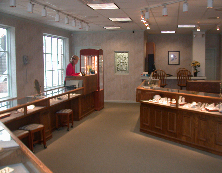 In the United Kingdom and Canada 9 karat gold jewelry is often sold. The color of the metal often gives us a hint of the karat of the gold. The stronger the yellow the higher the concentration of gold. An 18 karat ring typically appears noticeably more yellow than a 14 karat ring. Gold jewelry is often manufactured in other colors than yellow. In addition to yellow, gold can appear pink, white or green. These other colors are the result of combining other elements with the gold. 14 karat yellow gold is the product of gold, and equal parts of silver and copper. 14 karat white gold is the product of gold, nickel in large concentrations and copper. An new 14 karat white gold formula substitutes palladium for the nickel. 14 karat green gold is the product of gold, silver in large concentrations and copper. 14 karat rose gold is the product of gold, copper in large concentrations and silver. Designers are experimenting with the use of palladium, a member of the platinum group. A patented alloy recently developed is claimed by the manufacturer to be tarnish resistant. The alloy contains germanium, which is commonly used in fiber optic equipment.